It is indeed looking good. A substantial framework for your hillside. I do have a small concern - that track leading off the point near the Star Wars mug in the second picture has a pretty noticeable kink in it. All stock run over it OK? I ran some stuff over it yesterday with no noticable issue, I no longer own a first batch dapol 9F, that would have balked at a breath of fresh air. If I have issues I'll have to deal with it, I'm not sure how that kink appeared, I'm guessing the copydex has a little too much play in it and allowed the track to move before it cured fully. A very short space between updates on this one. Really has been a full day today. 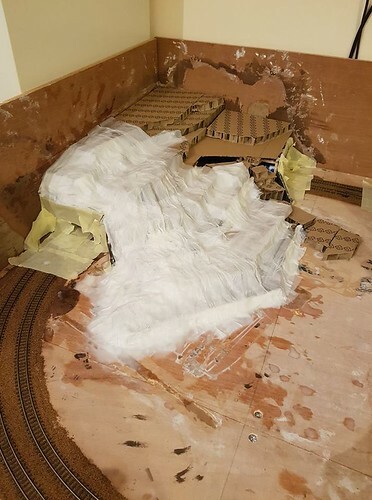 I have tried the kitchen roll method mentioned above, it seems pretty good to me, very cost effective as the amount of hillside you see covered in the photo done in plaster bandage would have been a roll or more already and they are £1 a go, not a huge saving but imagine doing an entire layout. The roll of kitchen paper has cost me around £1 and i've used maybe 8 sheets cut into small strips. Once tried and extra layers added to contour properly I am positive this will look the bees knees. I was thinking more in terms of stuff like lightweight Peco wagons? 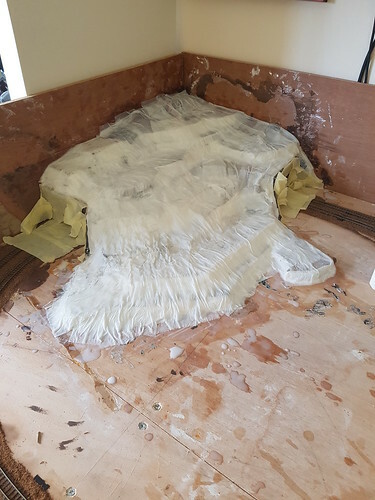 First pass is done, after it took 3 days to dry properly I noticed it was all too angular so I have cut back some of those angles with a craft knife and bulked out the edges with some news paper and kitchen roll. 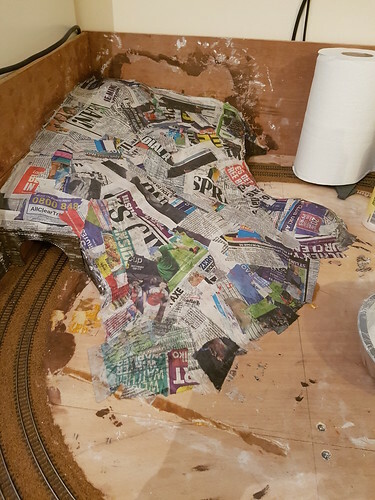 I have added some rolled up and bunched up news paper to some of the very flat areas to build up layers without using an entire roll of kitchen roll. 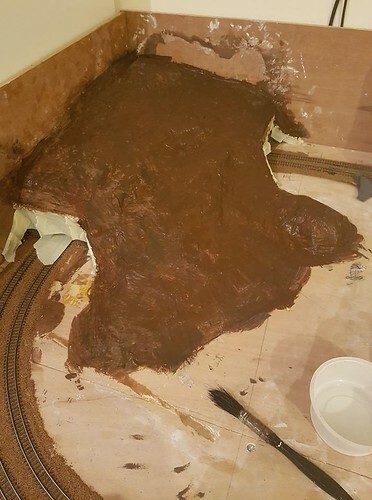 It sets like rock with a pva/water mix, it wont stand up to loads of punishment but it will be strong enough to paint and add scatter and static grass to. Now I will wait and see if I feel I need to do some more layers and adjusting. I'm going to make a start on the other hillside, this one will have a corner of Oakford Hills actual town on it, the rest will be backscene. I have spent some time yesterday doing some more work on my hillside and now a cliff face on the town side. As you can see I have changed tactics on the construction. I have reverted back to a more traditional newspaper soaked in dilute pva style, I did this because I was struggling to make the hillside flow, it was becoming very angular. 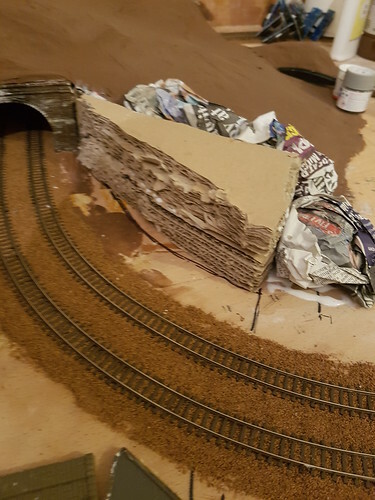 Using scrunched up newspaper I have added some lumps and bumps to the hillside to give it a more natural look, If I was modelling a quarry the original look was fine but I found this much better it has given me the correct type of terrain I was looking for. 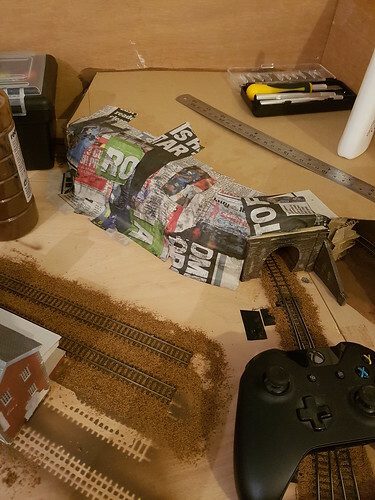 Originally I was only going to do the sections over the scrunched up newspaper but I found the join between kitchen roll and newspaper was too obvious so I proceeded to cover the entire hillside in it. This section has been made with a small retaining piece of card inside so no newspaper would end up getting pushed into the path of the track (clearances were tested) I then folded and scrunched up newspaper to fill the gap, this also gave me the look of a small rock face without really meaning to, I was intending to put a full retaining wall on this section but now I am quite happy to paint it up like a rock face and leave it at that. 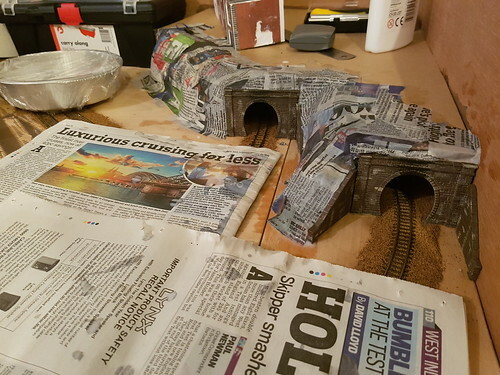 The pva and newspaper mix dried one hell of a lot quicker than the pva and kitchen roll did, it does not have the rigidity of the kitchen roll but it will work well once painted and covered in scatter and some grasses. 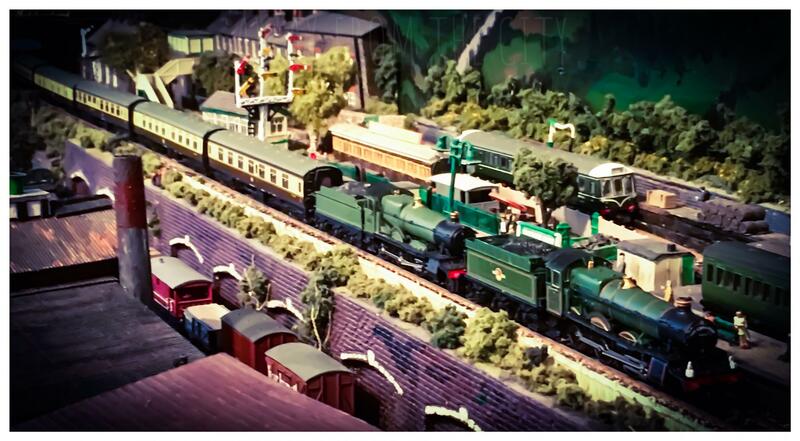 On a side note I have also built a small diorama for displaying locos and taking photos of them on whenever I get any new ones. It is a raised embankment on a small bit of ply which I will also use to practice some scenic detail techniques on. 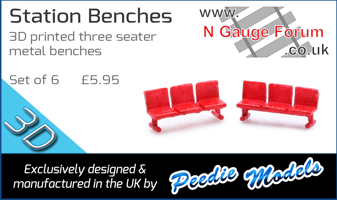 Can I ask what you are goung to use for the surface on the hillsides etc ? And will the hill continue upwards in the second photo where the box of cutting blades is sitting? It will mostly be as it is painted brown as a base colour, have different coloured scattered applied and maybe some rocks, some sections will be bare rock so sandstone colours as that is the area I am modelling. The other hillside is actually the corner of a town, it will house the station building, access to the platforms is via a footbridge, I am thinking of having some low relief houses on the back and maybe a church on the front near the tunnel portals, that or a folly. Follow up to this morning post on the continuation of my hillside. This is a base coat of burnt umber from the range. It will require a second coat once this is dry and then I can possibly think about scatter material. I think I might just be painting the backscene in a pale sky blue colour to be honest not putting a traditional one on with more hills, not on this side of the layout anyway. The other end will have a town scene for sure as it goes with the edge of town I am building. A slow start to the scenery today due to other things round the house needing to be done, then this evening it just took off and here we go. Filled in the gap between the two tunnel portals, before this I painted up and glued down the wing walls for each portal, I am unsure how the area to the left of the left hand portal will be so I have not put on here yet. 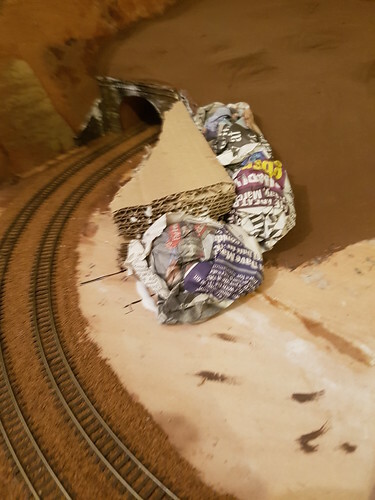 Good old papermache applied to give the cliff/hillside look, It's amazing how much just applying the news paper does to the overall feel of the layout. 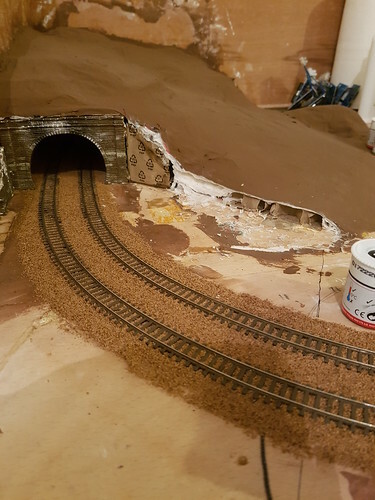 This was the most drastic work I have undertaken today, probably why I was reluctant to start because I am changing a portion of one corner into having the track in a cutting. 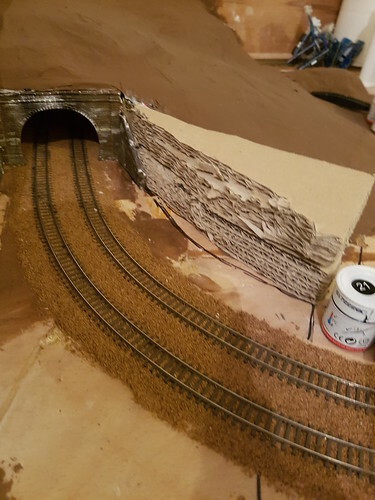 I realised that unless I put a level crossing in I wont have any road access to the middle, so I decided upon a bridge, which necessitaed this change in the gentle slope into a cliff face, which may have a retaining wall all along it I have yet to decide on that yet. This shows the area with the bulked up cliff area, I used some trusty mega thick cardboard I had left from other things. 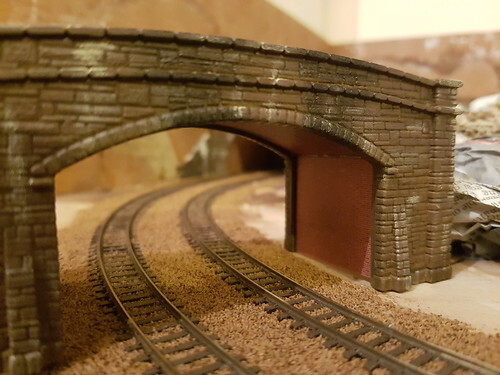 Once I have the bridge installed (got to buy it yet) I will know exactly how and where the rest of the bulking out will go, as I will also require a road surface too. I do love the messy stages before things really start to take shape. My one concern is.......can you get access inside that tunnel if you get a derailment inside ? Indeed, check previous posts as I have adequate access to both hillsides, I just move the layout from the cabinet and hand goes in. I was a happy fella today when the postie dropped a little parcel through my door, no not £1,000,000 cheque but my bridge I was expecting. I cannot find fault with trackshack at all, ordered my item on Thursday night and its here Saturday before midday, first class service and quality items. 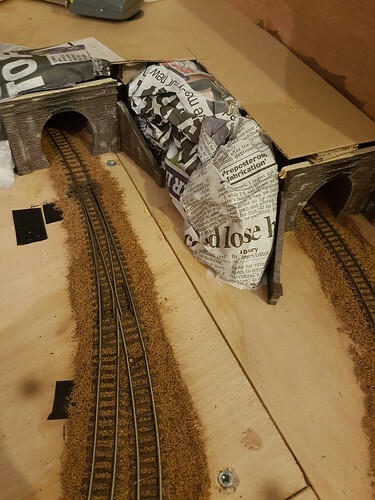 I have spent the rest of the day (despite chopping a load of logs up for the fire for next year) painting and building my double track bridge for the redesigned corner of the layout. 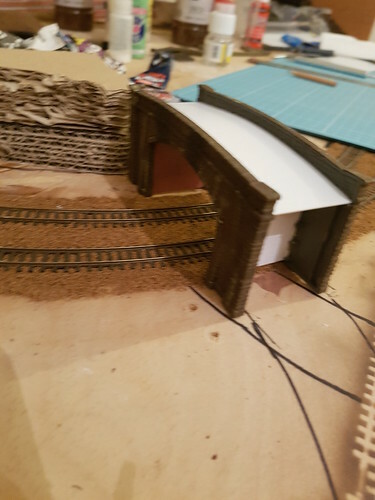 Using 20/000 (no idea what size that is) plasticard I formed the roadway on the bridge, googled the width of some premade roads in N gauge and came out with 40mm so thats what I cut it to. 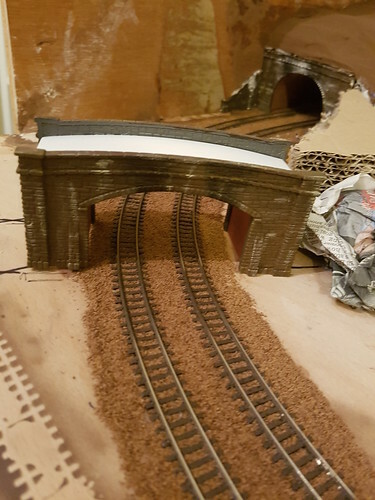 I used metcalfe brick sheets to form the main body (no idea what its actually called) under the bridge itself, for ease I formed the main arch out of one strip and the uprights out of two seperate ones as I did not fancy bending the arched bit and then coming into a 90 degree turn down in one piece. I think it has come out excellently and now I can continue with landscaping as I now have a reference point to build the rest of the landform from. 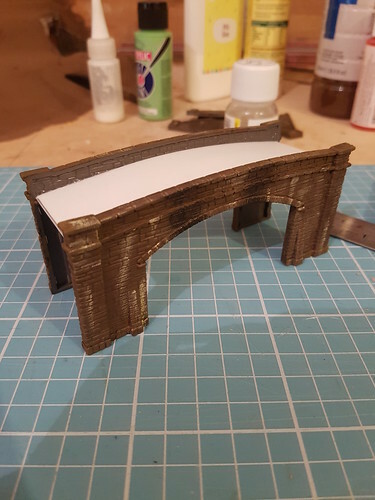 It cant be seen in the photos but I used a black watercolour pencil to darken the underside of the arch on the bridge, because it would get soot and diesel exhaust on it.